Jansen explained that 99+% of people in the industry, he believes, are committed to continuing to develop breakthrough therapies to prolong and improve patients’ quality of life. Jansen said, “And I’m very proud to be a part of the industry—but you have the 1% that come in and take advantage of the pricing inelasticity of the products.” Lynch pointed out that the US Army post-Vietnam had an image problem as well. After American soldiers returned from war with visible and invisible wounds, the public turned its back on them, Lynch said. 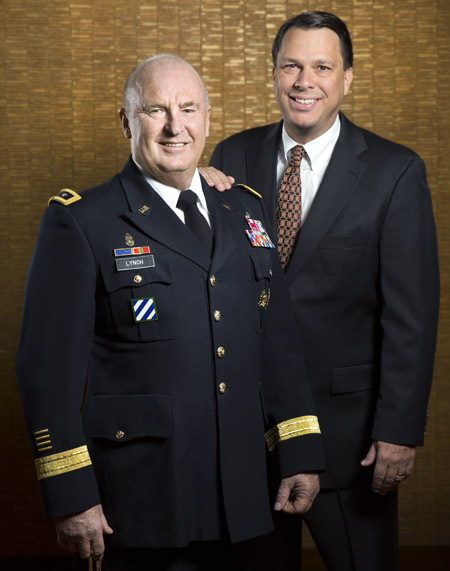 He told Jansen that the only way the pharma industry could change its public perception would be the way the military addressed the issue: by developing adaptive leaders with strong moral compasses. The other challenge discussed for the US military and pharma industry alike is the belief that the press wants to focus on negatives—the mentality of “If it bleeds, it leads”—discouraging coverage of the good things that come from those sectors. Lynch and Jansen left the leadership center as good friends. Lynch retired from active duty on Jan. 1, 2012, and proceeded to write his first book, Adapt or Die, Battle-Tested Principles for Leaders, released in 2013. The book is an interesting and educational look at Lynch’s life, chronicling the challenges he experienced and the insights gleaned as he rose the ranks in the Army. The book spans his years in the US Military Academy, to a Master’s Degree in Mechanical Engineering from MIT, to command of the Marne Division and Fort Stewart/Hunter Army Airfield, to Commander Third Infantry Division and MultiNational Division Center in Iraq from June 2006 to July 2008, Commander III Corps and Fort Hood July 2008 to November 2009, and Commander Installation Management Command and assistant chief of staff for installation management from November 2009 to November 2011. Jansen, meanwhile, left Wolters Kluwer/Symphony and using his extensive experience in pharma, founded Zensights in December 2012 to help biopharma leaders identify “best-in-class” vendors and further create meaningful engagement and partnerships between pharma companies and their strategic vendors. Thus the brainchild of the “Adapt or Die” series of meetings. Through both of their contacts and networks, Lynch and Jansen launched Adapt or Die in 2014 to a smaller, focused executive audience to spread the word of the importance of developing adaptive leaders in the pharma industry that have strong moral compasses. The goal was to introduce these pharma leaders to military leaders who had already been involved in developing adaptable leaders, to share their playbook. Military leaders such as former commander-in-chief and president George W. Bush; former secretary of the Army, George Casey; General Fred Franks; General Ben Griffin; secretary of the VA, David Shulkin; and Lt. General Butch Funk have been speakers at these meetings. The goal may sound lofty, but the meetings have been well-received over the years, and have gained traction with their audience. The list of speakers from pharma who have shared their experiences is impressive. They include Alex Gorsky, chairman and CEO of Johnson & Johnson; Bob Oliver, chairman of Otsuka Pharmaceuticals Canada; Sandy Costas, former president and chief operating officer of Quintiles; Dr. Sandra Milligan, senior vice president and head of global regulatory affairs and clinical safety for Merck & Co.; Mark Alles, CEO of Celgene; Perry Sternberg, head of US commercial, Shire Pharmaceuticals; Ramona Sequeira, president, Takeda Pharmaceuticals USA; Jay Galeota, president and chief operating officer, G&W Laboratories; John Arena, vice president and general manager, US psychiatry, Lundbeck; Victor Vaughn, senior VP of sales and marketing, Supernus Pharmaceuticals; Jack Bailey, president of the Americas for GlaxoSmithKline; and Murdo Gordon, chief commercial officer, Bristol-Myers Squibb. To that end, Galeota explained that the idea of constant adaptation in order to stay ahead is critical for pharma leaders to understand and, ideally, embrace. “Yet it seems to happen rarely, unless forced,” he said, noting the need for current and up-and-coming pharma leaders to consider adaptive leadership principles. While no one would dispute that the biopharma industry is full of smart, educated, and successful individuals, the skills and ideologies necessary to take the risk-averse industry to a new and necessary level in a shortened timeframe is not lost on many. In Lynch’s book, he elaborates on his nine leadership principles, and each of the meetings has tackled a specific topic so attendees could leave with a better appreciation of an aspect of leadership. Those topics to date have included values-based leadership; corporate social responsibility; ethical and strategic decision-making; innovative partnerships; and the latest in December on mentorship. Much of Lynch’s book includes what some people would think is common sense. Follow the Golden Rule—treat people the way you want to be treated. Walk the walk. Leaders should look down, not up. Do every job superbly. Be sure that people know you are doing a good job. But in the book, and at the Adapt or Die meetings, Lynch shares examples of poor leadership and how he started to keep a booklet of what not to do when he became a leader. As noted, Galeota has a military background and completed four years in the US Air Force Reserve Officer Training Corps. J&J’s Gorsky attended West Point, graduated and was commissioned as a 2nd Lieutenant in Field Artillery and later completed Airborne School. Merck’s Milligan was a general medical officer in the Army and Celgene's Alles a captain in the Marine Corps. In Pharm Exec’s most recent Emerging Pharma Leaders issue, two of the leaders profiled have served. Whether or not that is a hallmark of inspired leaders or people who want to continue to contribute, Hammond says, “There are skill sets in the military that translate into good executive leaders. Number one, we institute a very strong moral compass, as this is crucial based upon the type of work we do. Our leaders operate on their own in austere conditions, and have to use their best judgement. If they make bad choices, really bad things can happen and people can die. So we develop a heavily mandated values system which becomes ingrained in them. Lynch and Jansen said about 400 executives in the healthcare arena have attended their series. Lynch continues to believe that adaptive leadership will help companies in any industry respond more successfully to the changes around them. Specifically, for pharma leaders, Lynch says the meetings “challenge the norms and puts life in perspective for these incredibly accomplished leaders, and I do believe these meetings will transcend for these people that attend so that the public understands the value of the pharmaceutical industry.” Both Lynch and Jansen have received feedback from attendees who say they have learned valuable lessons, have looked at their behavior, and made changes when they returned to their respective organizations.